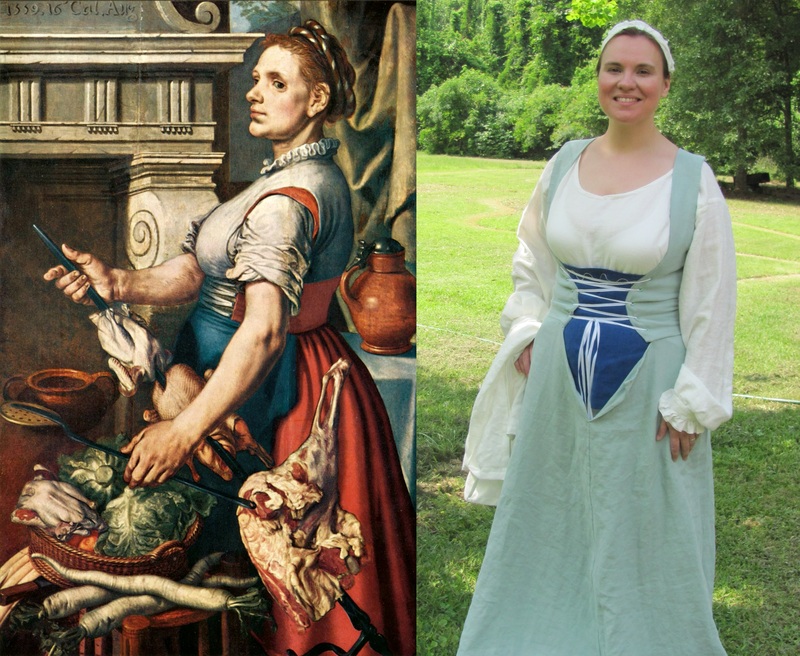 It’s been a month since I’ve posted anything about my 16th century Flemish costume. Where did I leave off? Ah, the dress. On to the construction. 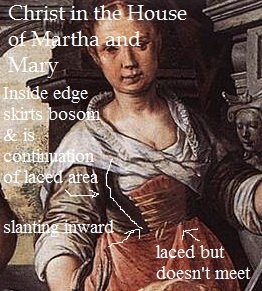 When it comes to 16th century Dutch dress, there are two main theorists. Kass is one. 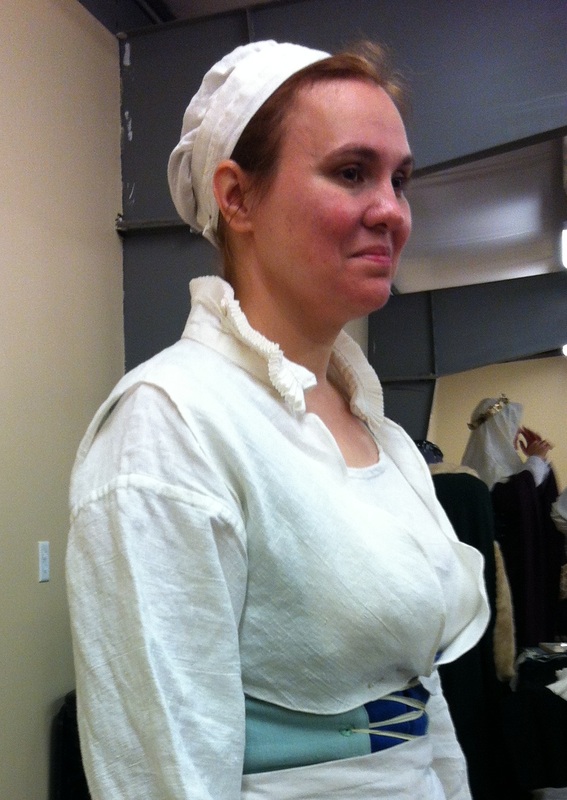 The other is Drea Leed: http://www.elizabethancostume.net/lowerclass/makeflem.html . It’s not that I disagree with Drea. I felt that Kass’s ideas would result more in the look I wanted to achieve than Drea’s. 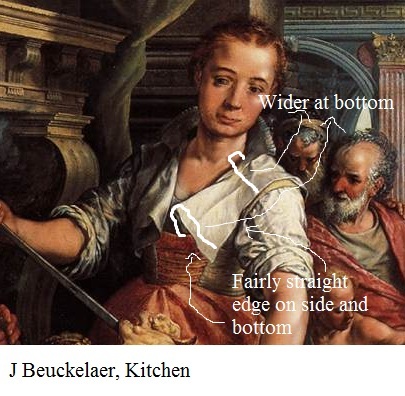 The look I want comes mainly from the paintings by Joachim Beuckelaer and Pieter Aertsen, two 16th centruy painters who mainly worked out of Antwerp. 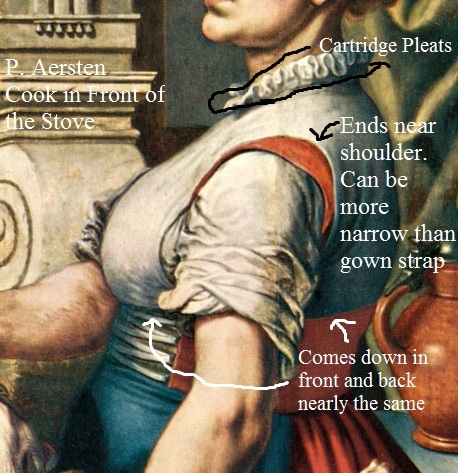 If you go to Kass’s part two in her Netherlandish Working Woman’s Outfit ( http://www.reconstructinghistory.com/blog/the-netherlandish-working-womans-outfit-part-2.html ), she gives fairly straight forward instructions on creating the bodice part of the gown. 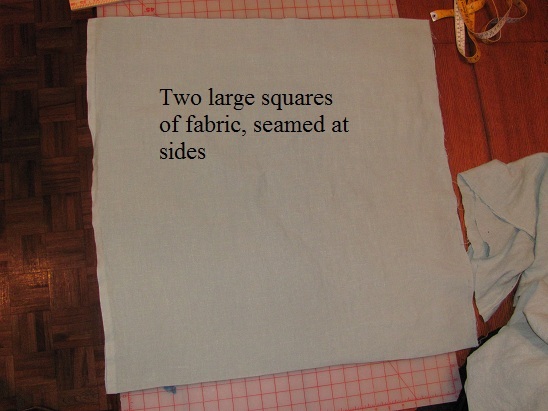 I started out with two squares of my linen. I sewed them together to give the bodice extra strength when lacing. 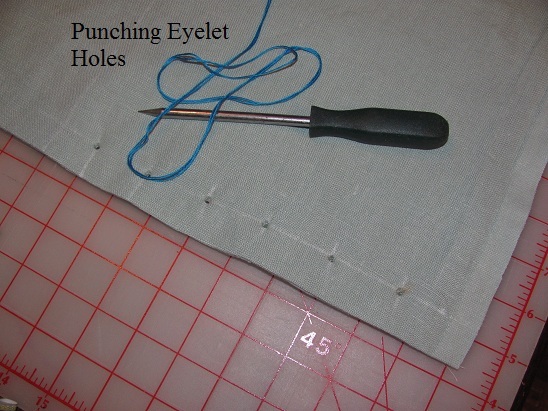 Using my modern awl, I made the holes for the eyelets. I really do need to get a more period awl. 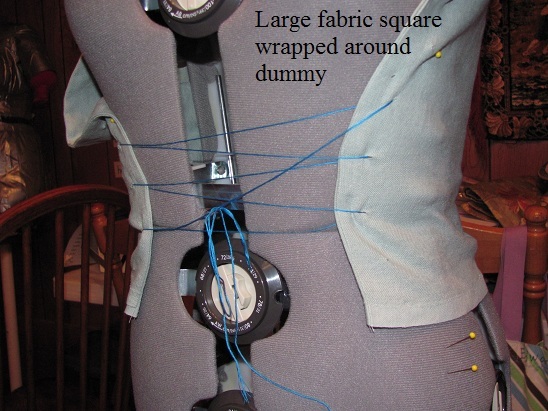 I laced the square of fabric around the mid-section of my dress dummy. 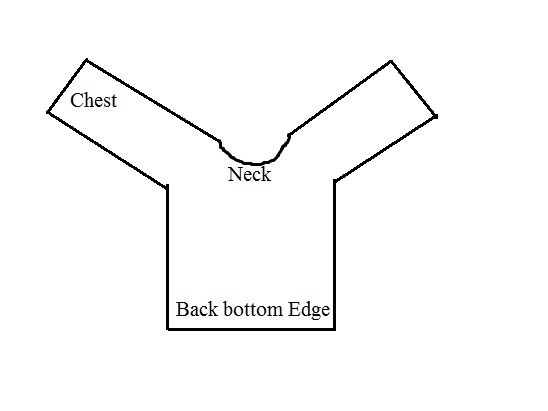 To prepare for making an armhole, I made a slit from the top of square, where it hit my shoulders, down to about armpit level. I squared off the hole in order to get to the shoulder seams. The square I used was way too long. I ended up wasting a good bit of fabric at the top. 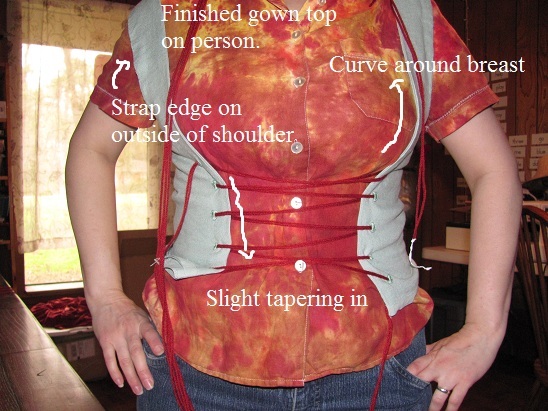 If I make something like this again, I’ll figure out how to use measurements to get a more accurate piece of fabric. I sewed up the shoulder seam a bit at a time until it fit fairly snug. The pieces of the skirt are pretty geometric. At this point, I had not had as much experience making pleats, so I first tried box pleats. 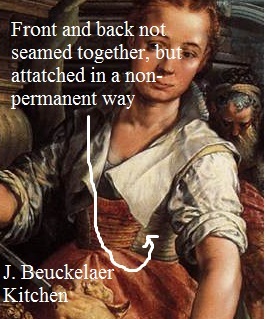 The rear ends of the women in these paintings are awfully large, but I couldn’t justify using a bum-roll. Why would a working class woman wear a bum-roll? My guess is that the look was achieved with pleatings. Box pleats, however, did not work. So I tried cartridge pleats. 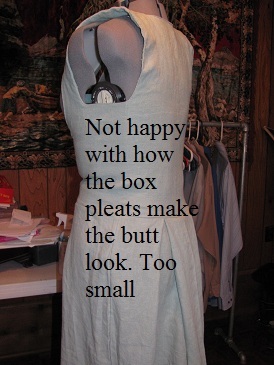 I’m not unhappy with the pleats, but I still need to go back an re-attach them. My method of attaching them to the bodice part flattened them out a good bit more than I wanted. Overall, I’m happy with it. I achieved the look I wanted, minus a few minor errors. I did, however, learn quite a bit. 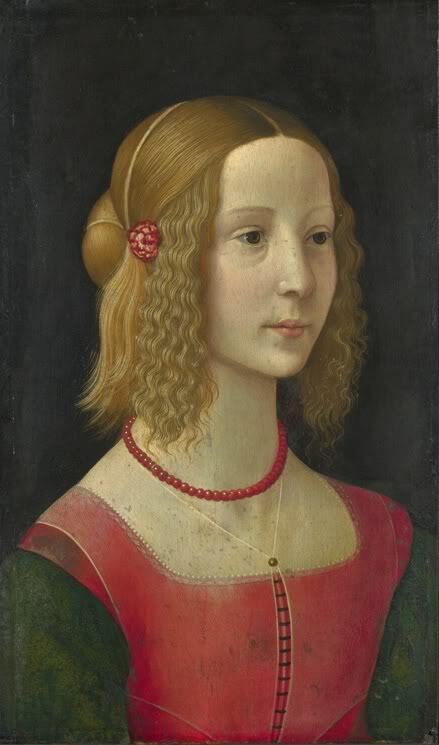 After several days of searching through 15th century Dutch painters, I think I found what I am looking for. I was so excited last night when I found the picture. I just sat and stared at it for several minutes with glee. 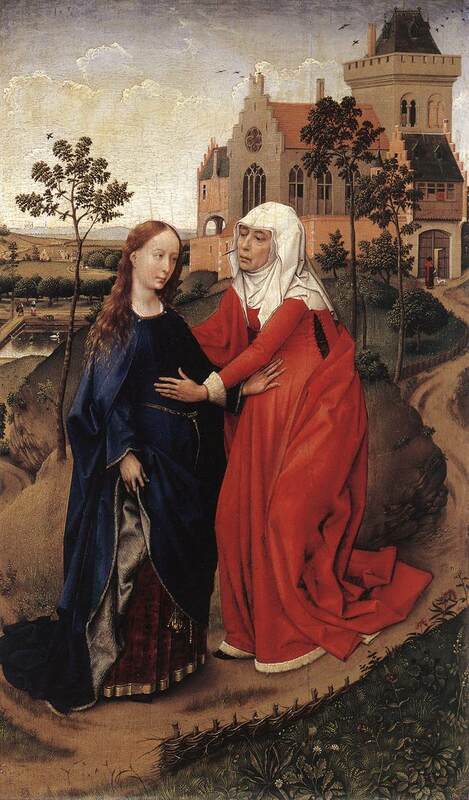 But then today I actually read the title: The Visitation. That refers, again, to the point in the Bible when Elizabeth visits Mary, both of whom are pregnant. 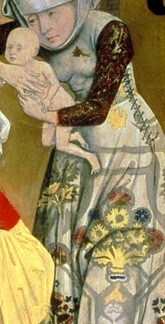 Perhaps it’s time to throw in the towel and just admit that an un-waisted side-laced 15th century cotte was mainly used as a maternity dress. In another 500 years, when some futuristic SCA group is re-creating the 21st century, it would look pretty silly for the non-pregnant women to be wandering around in maternity wear. So until I find more evidence, either it’s a side-laced cotte with a waist-line or, if I want no waist-line, it’s a front-laced cotte. So what do I have so far? 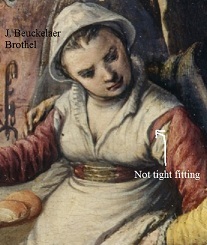 15th century Flemish cottes could be either laced in the front or the sides, with the former being more common than the latter. But in my own interest, let’s start with the side-laced version. 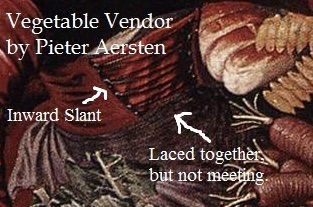 I have not been able to find many articles or writings on the side-laced kirtle, so hopefully what I’ve gathered will help others. 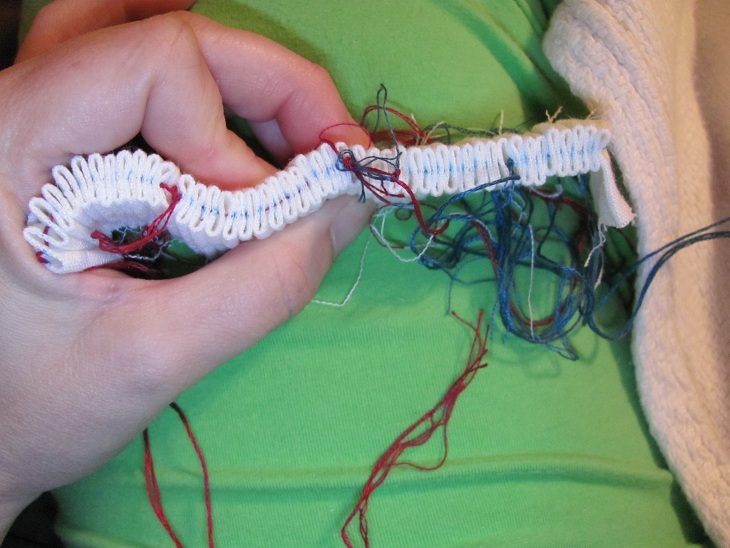 The lacing goes from the armpit down to the waist-line. 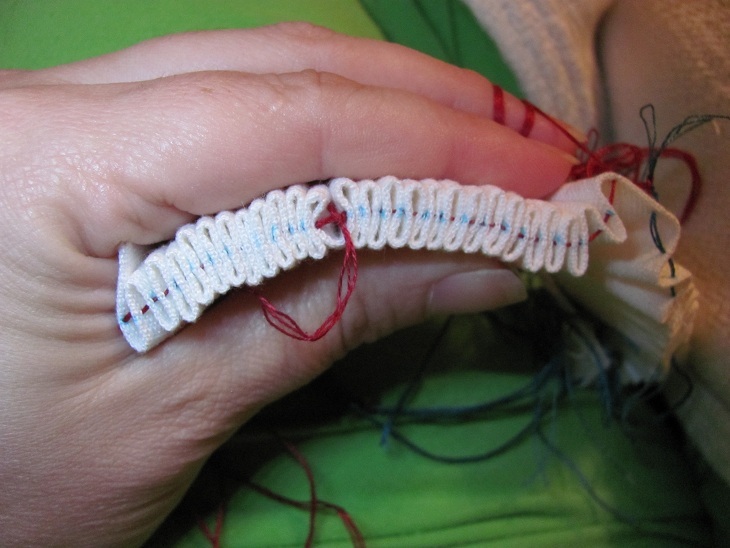 The eyelets are off-set and the lacing is done using a spiral lacing method. The dress has a waist-line. 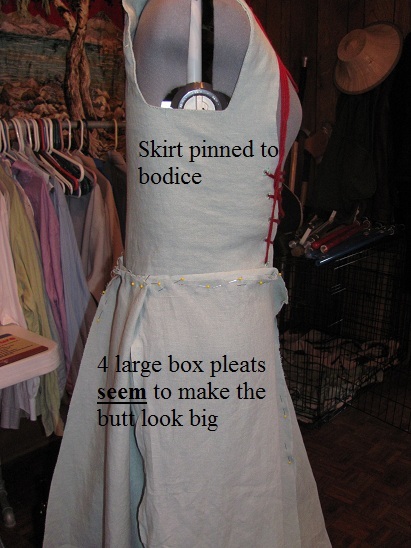 The skirt is separate from the bodice. If you look at the skirt edge, the gown is lined with a green fabric all the way down to the hem. 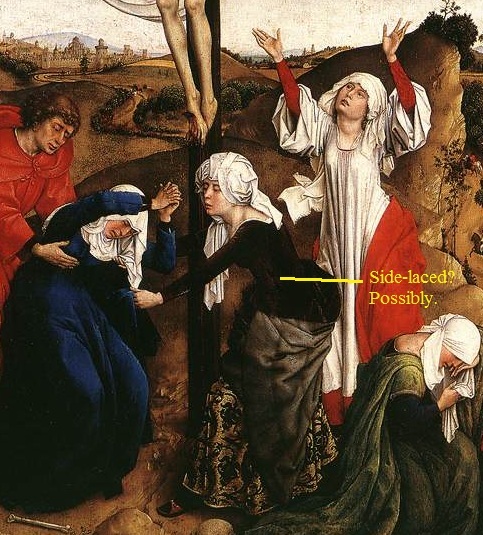 Since Mary Magdalene is wearing the dress, I’m assuming that she’s not pregnant. If you look at the rolled up hem, the gown is lined with a grey fabric. This one is, of course, the pregnant Elizabeth. 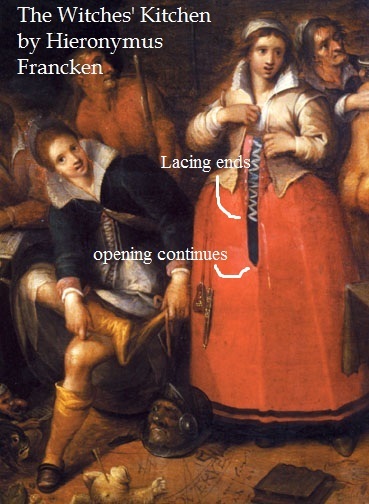 I have a few more iffy pictures that could be side-laced, but, until I get versions of them with better resolution, I’m not willing to assume that they are side-laced. Finding evidence for this cotehardie that I want to make is proving a bit more difficult than I thought. It’s out there, but under what conditions, I don’t know. Here’s the problem: for the most, part the pictures from manuscripts are very cartoon-ish. They give a general shape and idea, but they don’t show seems or closures. This is a definite side-laced fitted gown. Of course, you can’t just look at the what, you also have to look at the who. The lady on the right is Elizabeth, cousin to Mary (from the Bible). They are both pregnant, Mary with Jesus and Elizabeth with John the Baptist. Thus the intimate feeling of the bellies. So yes, the cotte exists, but was it maternity wear? Yes, it’s the same painter. Also, the side-lacing isn’t completely clear. A search for a better resolution of this pic may be in order. The lady in red is definitely wearing a side-laced gown. It is waisted, and I am looking for unwaisted examples. 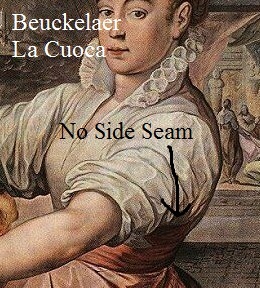 But it is certainly a side-laced dress. I’m not sure who painted the one above. 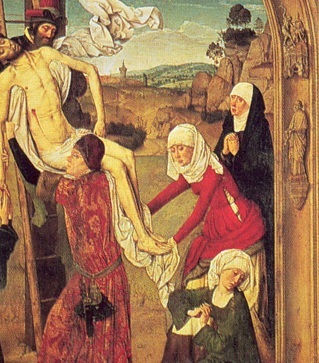 Heck, I’m not even sure that the name is correct, but it does look like the same style of der van Weyden’s 15th century Flemish style. It gives me something to go on. This one is a bit earlier than I wanted, but not so terribly early that it’s un-useful. Those sleeves, though . . . Wow! 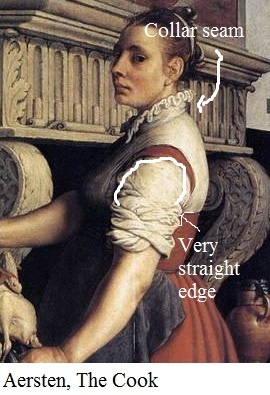 I have no idea where it is from, what time period or the artist, but it certainly is a side-laced kirtle. And a good shot of spiral lacing. 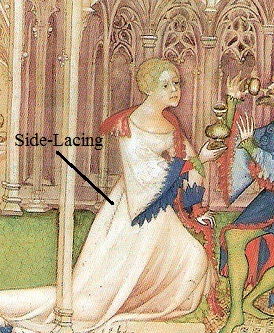 Tip: if you are going to make any kind of medieval or Renaissance laced dress, check out Jen Thompson’s Zen of Spiral Lacing post: http://www.festiveattyre.com/p/the-zen-of-spiral-lacing.html It will help you get it right the first time. 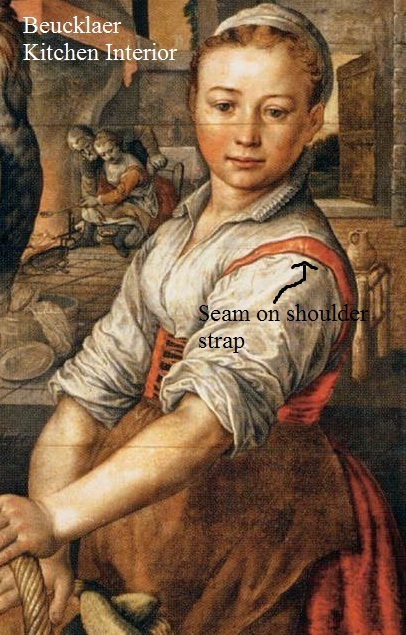 One thing I find utterly ironic about this quest of mine is that it has led me to Flemish artists as the main source. At least for the moment. I was certain I would find what I was looking for in Italy or France, but never back to Belgium. 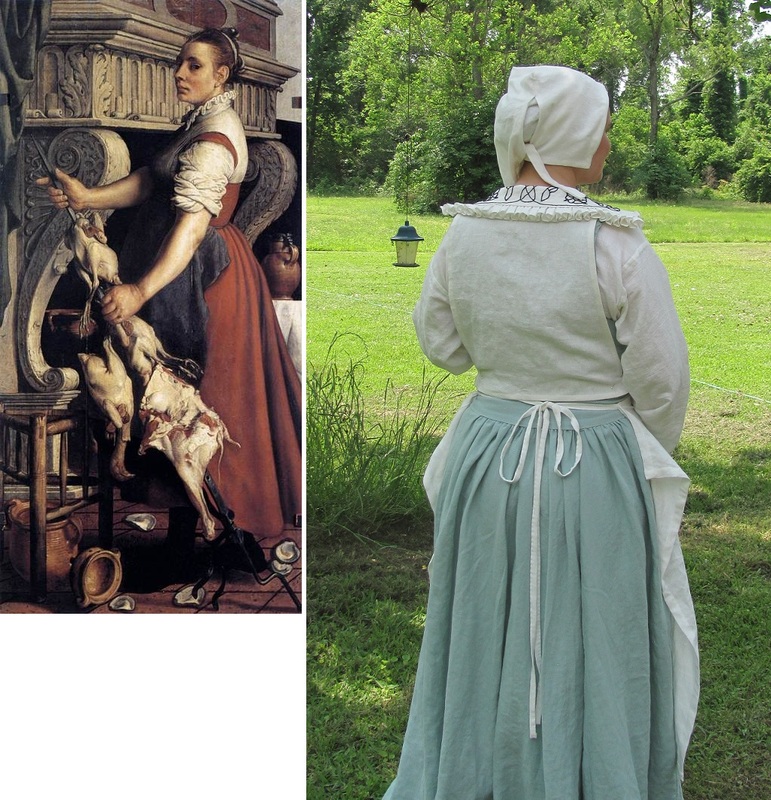 This whole obsession of mine with period garb started out with the 16th century Flemish peasant dress. So in the last year, I’ve come full circle. 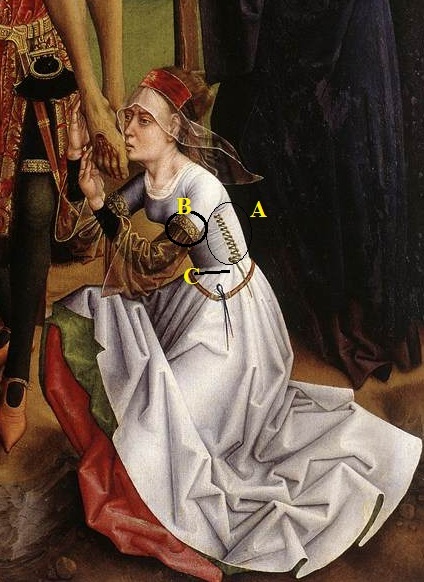 This gown or overgown was worn as the outer most piece of full body clothing in the 1540’s to 1560’s by working class Flemish women in Antwerp, the largest city of Flanders at the time. This first note of two will describe the features of this specific type of 16th century Flemish gown. 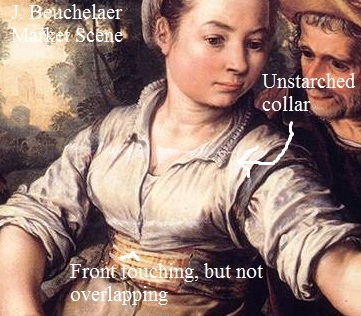 Since no extant gown from this place, time and social class exists (as far as we know), I’m mainly using paintings done by two artists who painted many portraits of Antwerp’s working class. 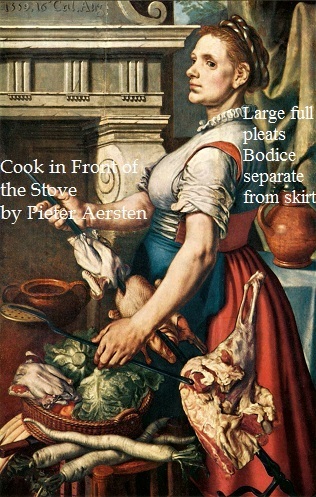 Pieter Aertsen’s and Joachim Beuckelaer’s paintings captured so many aspects of the working class’s life. Through these, we can glimpse the everyday activities of a class of people that are rarely noticed. My second note in this series will focus on how I made my version of the gown. Let’s start with the top of the gown and work our way down. 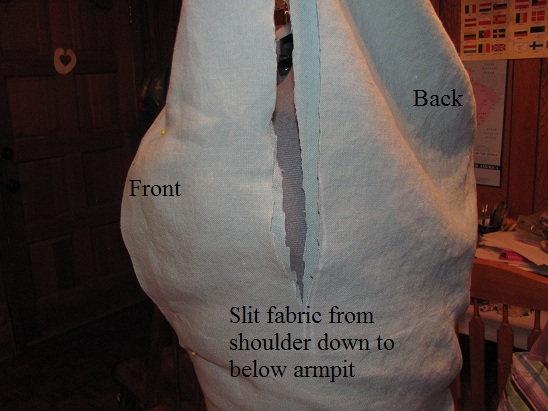 Possibly constructed using a solid piece of fabric and cutting the armhole out of the top middle. No side or back seams present. She explains why she thinks this way. 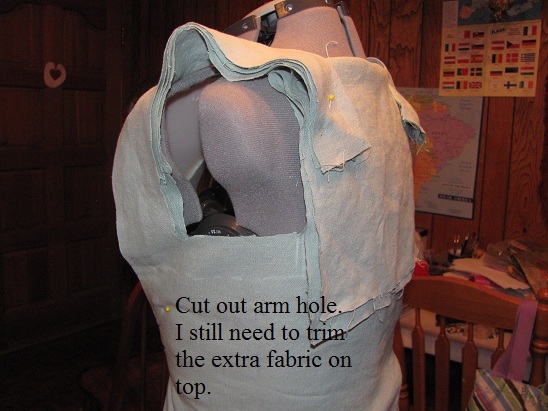 I’ll show how I constructed the bodice from one solid piece in the next post on this topic. What goes on under the apron is less evident. The front opening seems to be open down past the navel, almost to the groin. Yet it only has lacings for the area from the waist to the top. You can also see this in Johann Theodore de Bry’s illustration. 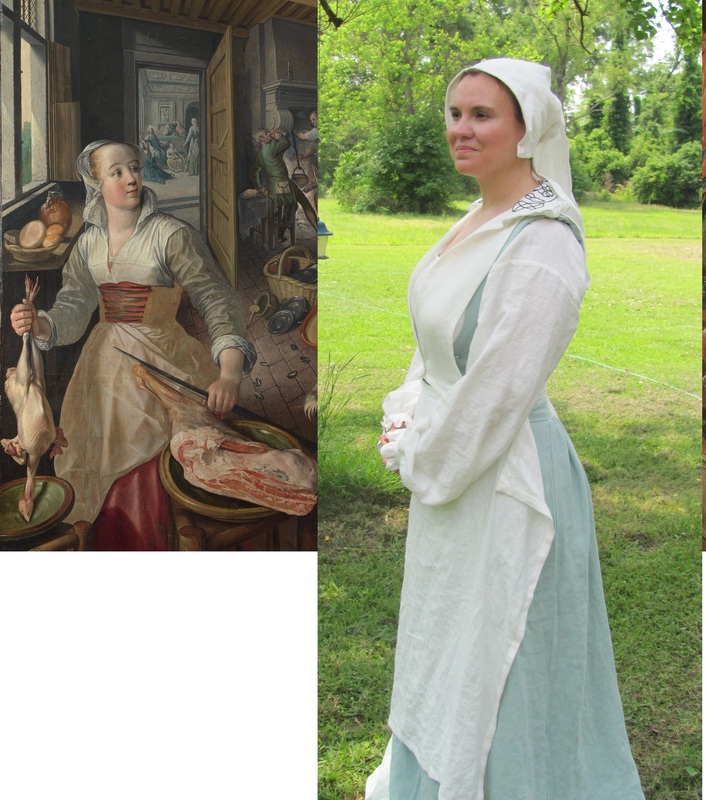 As I promised, here’s how I made my 16th century Flemish working-class woman’s white linen partlet. 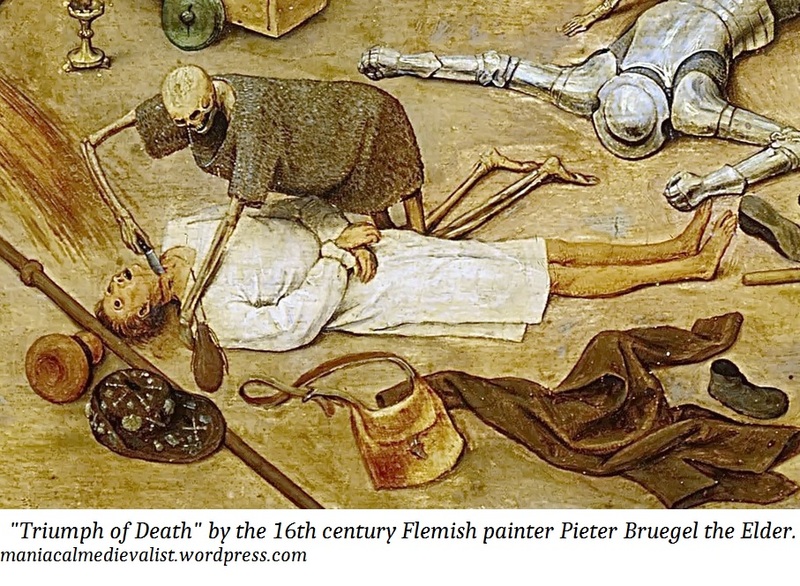 I found a cool painting that I forgot to include in my other Flemish partlet post. 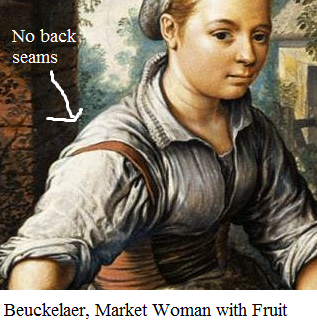 No extant working-class woman’s partlets from 16th century Antwerp exists. The best I could find is a slightly out of period (1607) painting by Jan Breugel the Younger. 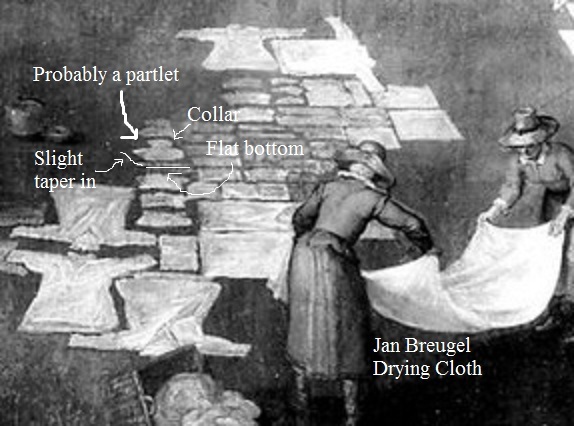 The painting shows a “bleach field” – a large field where the washer women lay their laundry to dry. 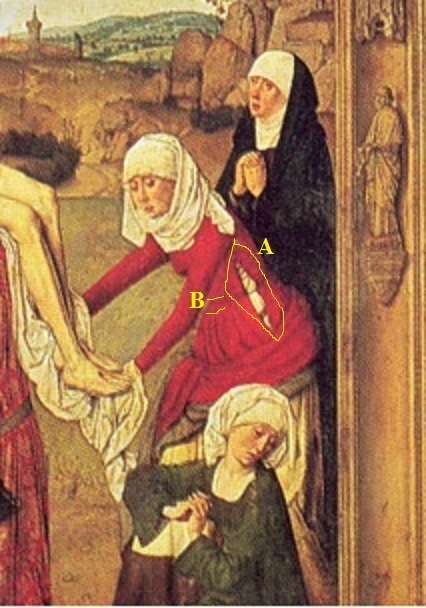 The best copy I could find is still blurry, but I am almost positive that the figure I’m pointing to is a partlet. The pattern itself looked simple enough: one solid piece of fabric for the front and back and then a separate piece for the neck. However getting it to hang right was a trial. I did about 6 full cotton mock-ups and several more partial ones that were rejected immediately. The pattern I settled on, of which I didn’t take any picture (by that time I was doubtful of ever finding one that laid right), was not the rectangle version I started with below. Proto-type #1. Did not work. Once it was finished, it was obvious. 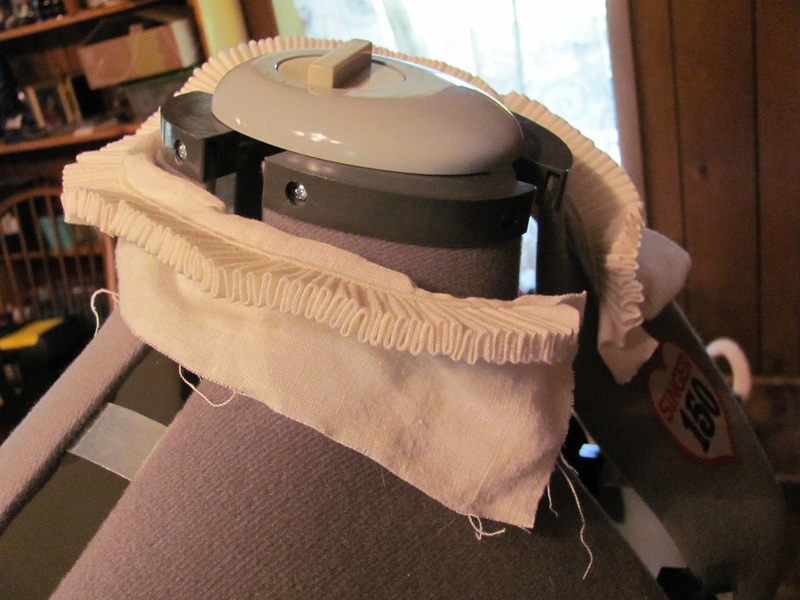 The flaring out of the front pieces make the fabric on the shoulder ends much less, thus solving the bulging problem. Totally unrelated: One of the things that has been a detriment to my teaching has been those “ah-ha, that should have been obvious” moments. When things finally click, I always feel like such an idiot. The solution should have been apparent the whole time is generally the way I think. I discount all those little gradual “ah-ha”‘that all added up to the big one. So then when I go to teach, I try to go straight to that “this makes perfect, logical sense” answer, and it doesn’t always work. For example, I’m teaching my homeschool co-op class how to make and draw your own Celtic knots. The subject to any normal person should be fairly intimidating. I’ve been doing it for a few years now, and so it all seems logical. Last week, I tried to skip all of the baby steps and lead my class (of mostly 10 year olds) to that logical end. I got one student who caught on right away and a bunch of others who had no clue as to what I was getting to. Columbus picked up a cooked egg from his plate and challenged his fellow diners. “Show me how you can get an egg to stand on its smaller end.” The men tried getting it to balance for a few moments before they asked Columbus to show them. He took the egg and smashed it on to the table, small end first. In other words, take pride in your “ah-ha” moments, even if it seems that the answer should have been obvious. Once I had the pattern figured out, it was on to the cartridge pleats. Now, I love me some pleats, but cartridge pleats were sent from hell to torment us folk who have even a slight trace of OCD. Getting them to be perfectly even is not easy. 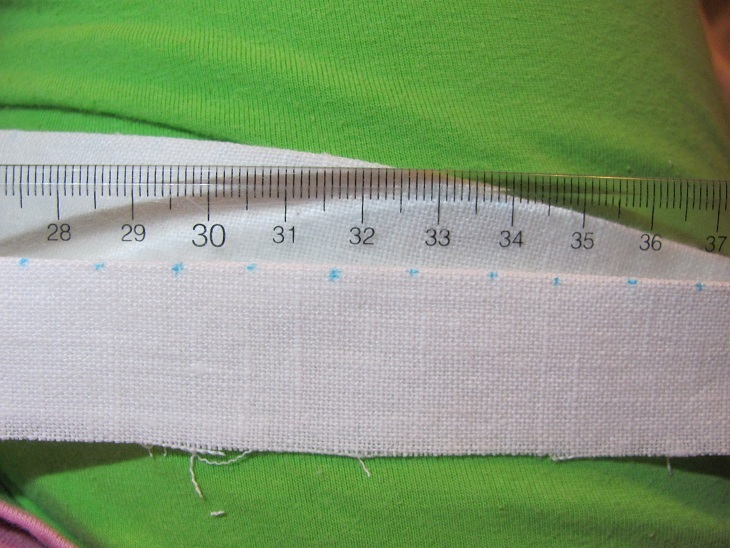 Carefully measure 1cm dots along 4 yards of 1 1/2″ fabric. It doesn’t have to be 4 continuous yards. I used the scraps that were left from cutting out the body. There were a total of 4 pieces – three that were about 1 1/4 yards and one that was about 1/2 yard. All of the fabric was ironed in half before I began marking. 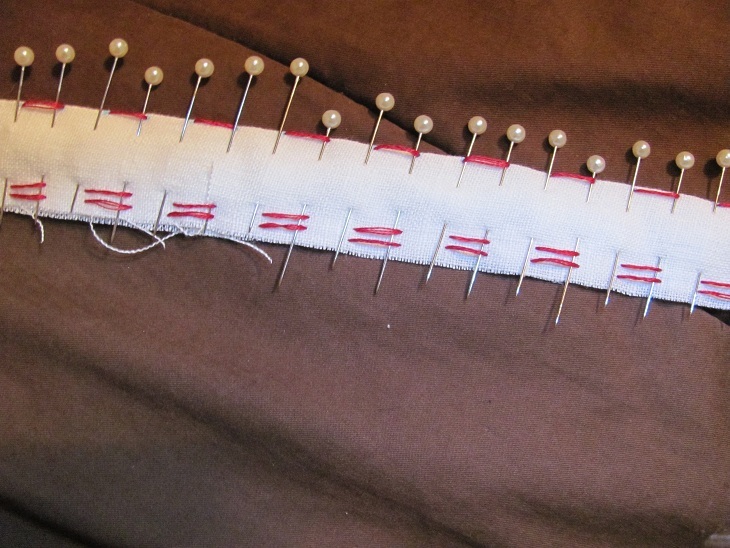 Because I did not want an excessive amount of marks to wash out, I used long quilting pins to run a straight line with each mark. Each mark equals 1 running stitch made at the top and 2 at the bottom (about 4 threads from the bottom edge and then another 4 threads up). I wanted my stitches as even as possible, so I used a magnifying glass to make sure each stitch was where it needed to be. The extra effort makes the pleats look nicer. 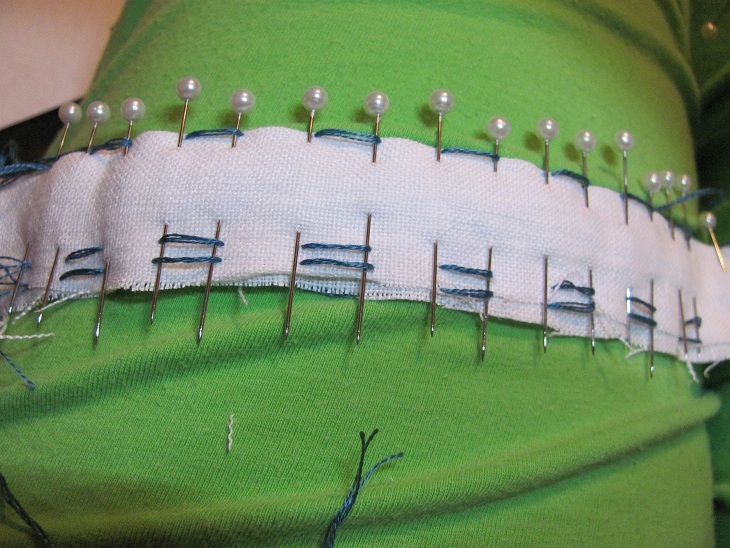 Normally I would have used white thread for these spacing stitches. I used a dark color simply so that they would show up against the fabric. 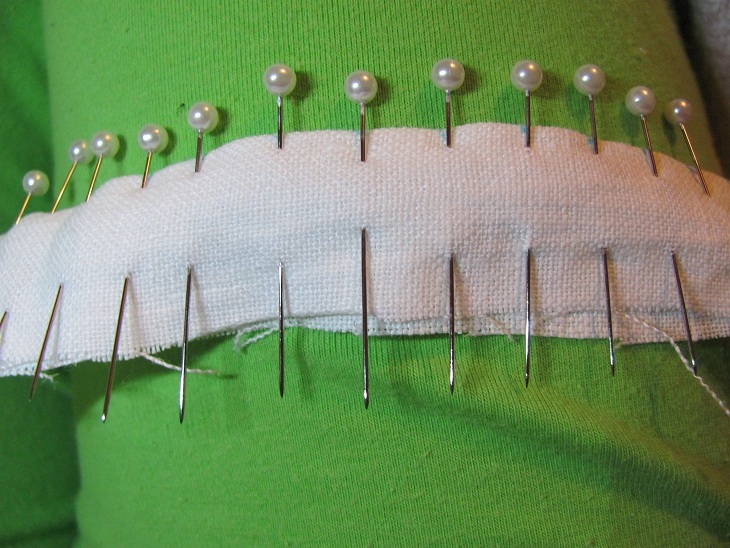 At this point the pins are unnecessary, so pull them out. Yes, cartridge pleating is very tedious. 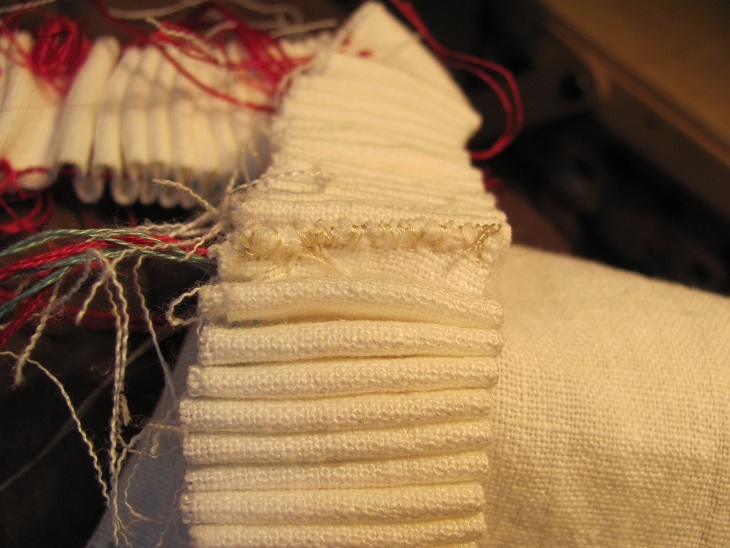 By pulling all three threads, the pleats come together nice and evenly. Now do it again for all of the other lengths of fabric. 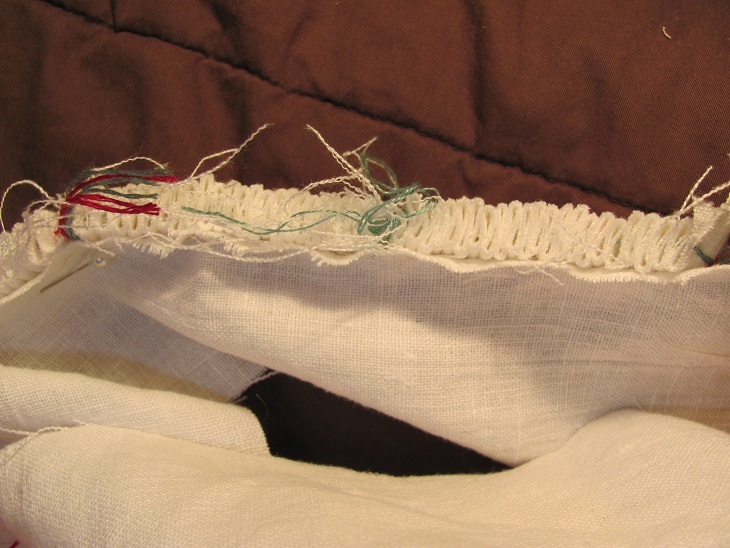 Each length of fabric will probably take more than one piece of thread. Just leave a long enough tail on the end and tie them together once they are gathered. The lengths of fabric can be sewn together post-gathering. 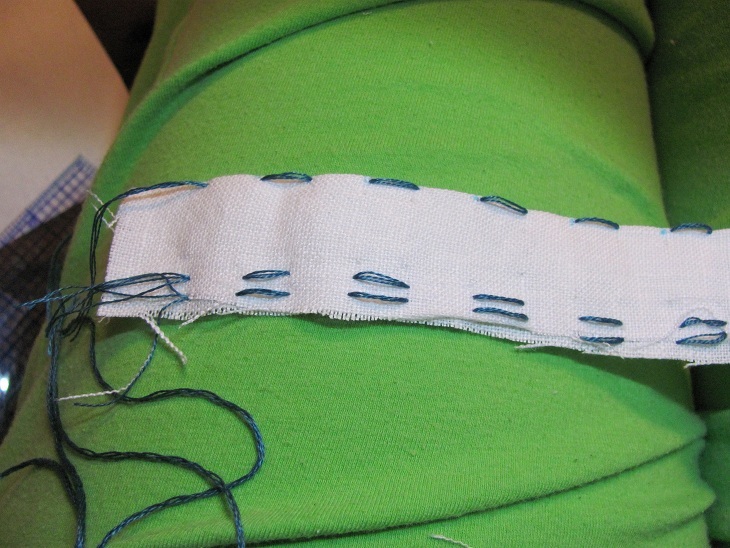 I used and overcast stitch to bind the fabric edges. Making sure that the pleated fabric is long enough. Sewing one side of the collar onto the pleats. One side of the collar is sewn on. At this point the pleating stitches are still in. 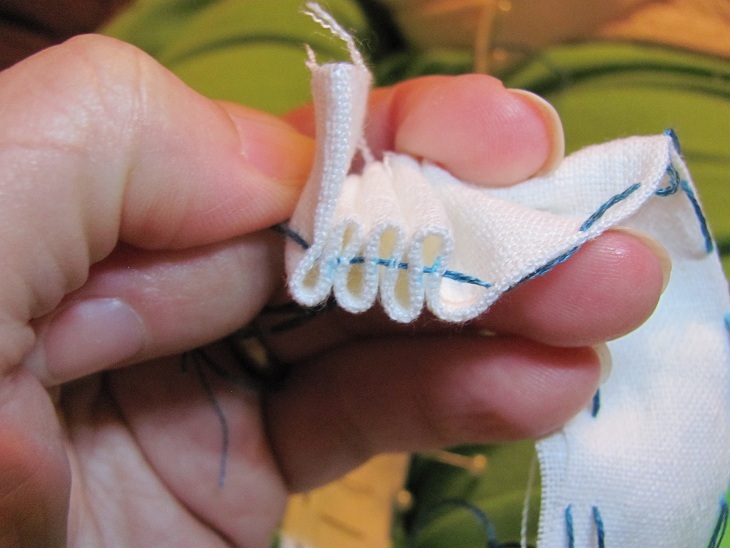 Make a double row of back stitches to make sure that the pleats stay. 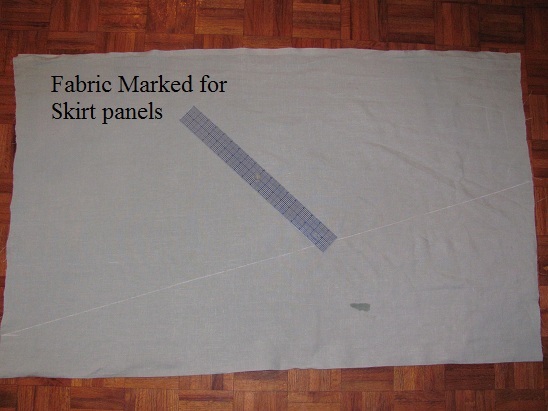 On the opposite side make a line of back stitches through the pleats to make sure that the pleats stay put. 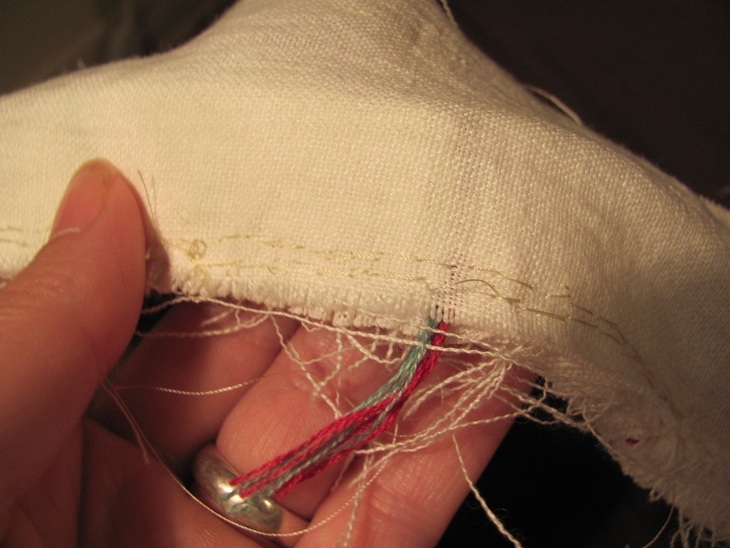 At this point, the gathering stitches are still in, but not necessary. 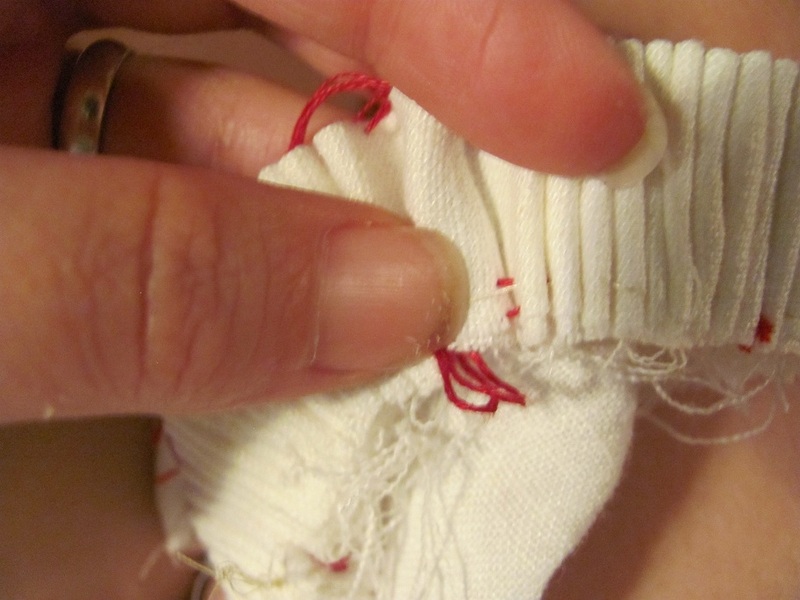 Using a small, sharp pair of embroidery scissors, snip and pull the stitches out. 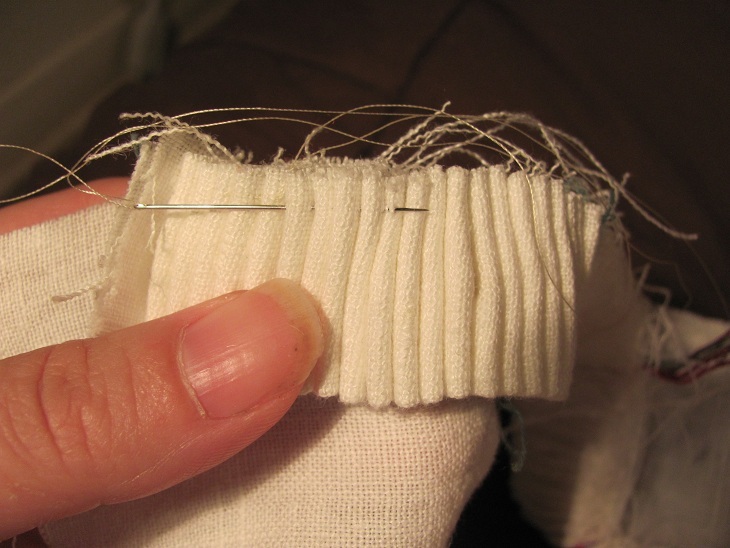 I used scissor grip tweezers to pull the threads out without disturbing the pleats. At this point I wish I had not used red as one of my contrasting thread color choices. Since the pleats so tight, when I pulled the red threads out, it left a trace of red color. It’s very faint, but it’s still there. Stitch the other side of the collar on with 2 more sets of back stitches. 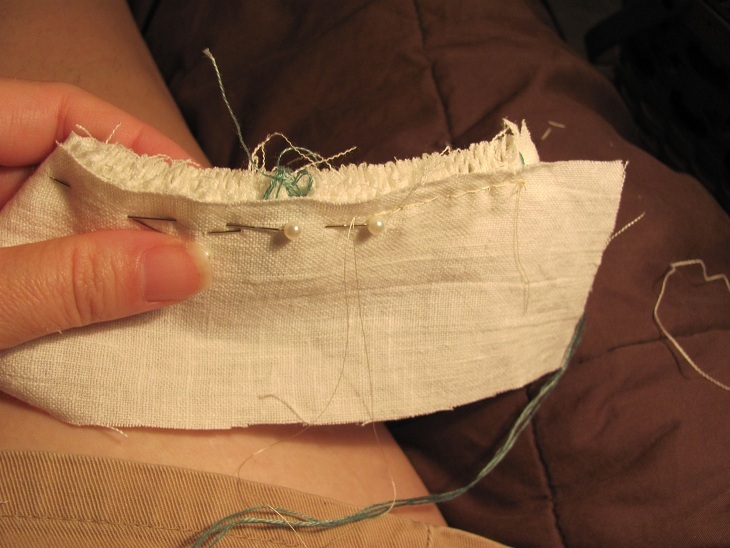 Turn both sides of the collar down, and make a running stitch to tack the sides down to the pleats. Attach the collar to the partlet, hem the partlet and then it’s done. I spent most of this year working on one of my first complete outfits made not using a commercial pattern. Let’s start with the outer most layer, and I’ll work my way in. 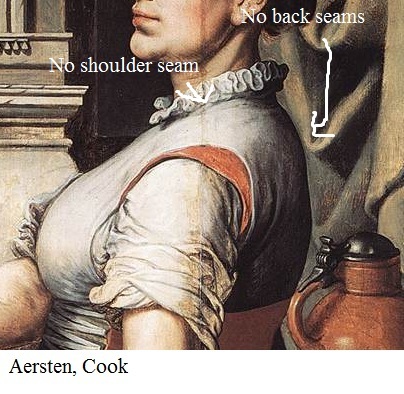 First of all, a partlet or gollar is a woman’s piece of over-clothing, which covered the bust, back and shoulders. It’s akin to a sleeveless jacket, but ends directly beneath the bust. 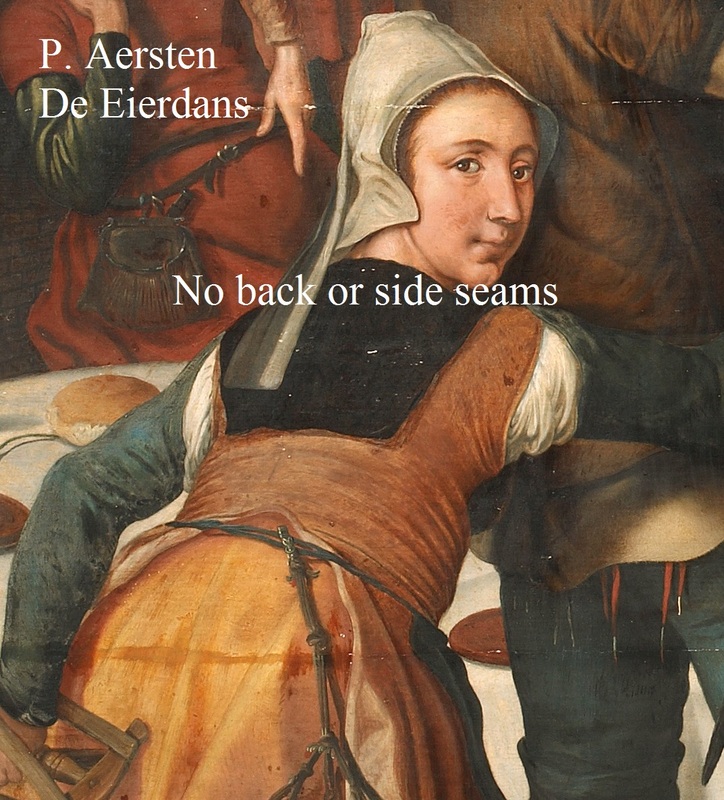 In 16th century Flanders, all classes of women worn one if they left their home. It was actually more universal than that. 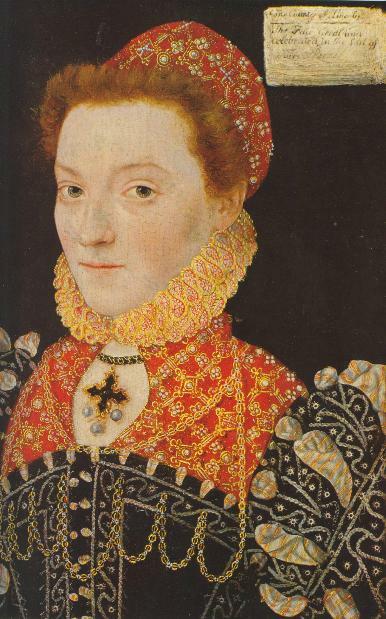 The women in nearly every European country at this time wore some kind of partlet or vest. I’ll be using the English term: partlet, although in Flemish literature at the time it would have been more likely called a gollar. Although it’s not so black and white as that. Most cultures around Europe at this time had varying degrees of extravagance for their partlets, from the plain white linen to ones that were made of very detailed lace with pearls and gems. 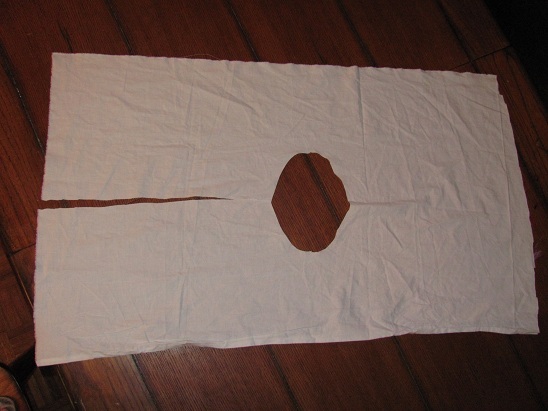 My partlet is one of the white linen varieties. It’s the style worn by middle and lower class women. 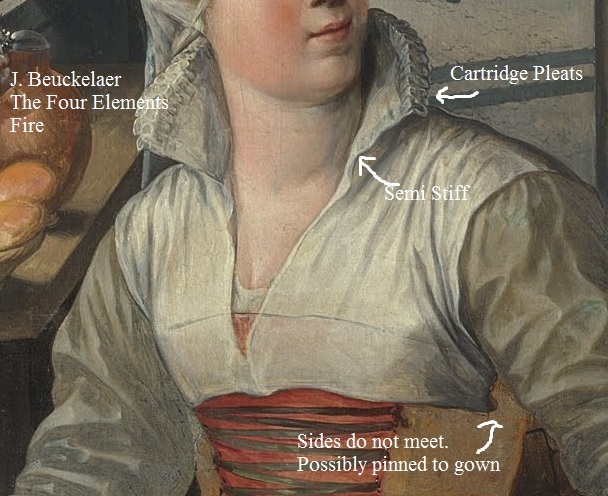 This partlet is meant to be worn as a vest over the overgown. 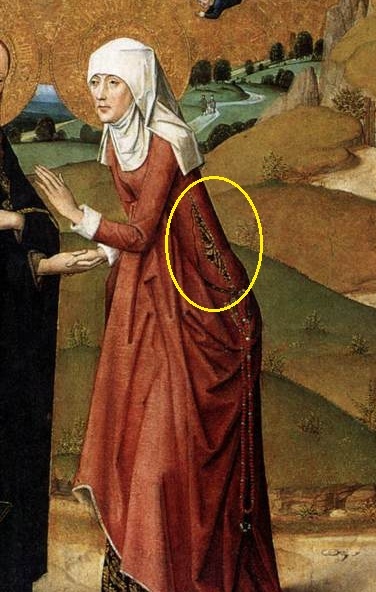 It can be worn as the last layer of clothing on the top half of a Flemish woman wore or worn under a black wool partlet in colder weather. There is no extant plain white partlet from the Netherland area. What I used to base my idea upon was the paintings of the time. The collar varied between stiff to limp and folded down. The front two corners meet, but don’t overlap. Meaning they must be held down by separate pins. 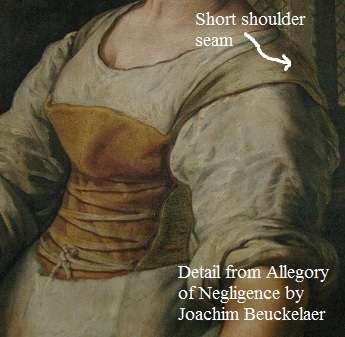 End near the ball joint of the shoulder – sometimes before the gown strap ends. 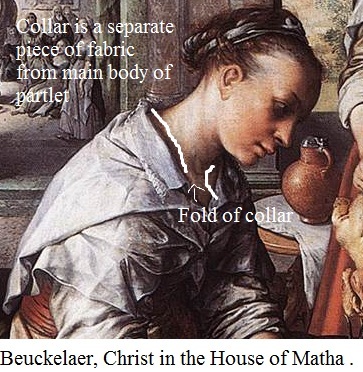 The collar was sewn on from a separate piece, and it seemed to be the only separate piece from the main body. 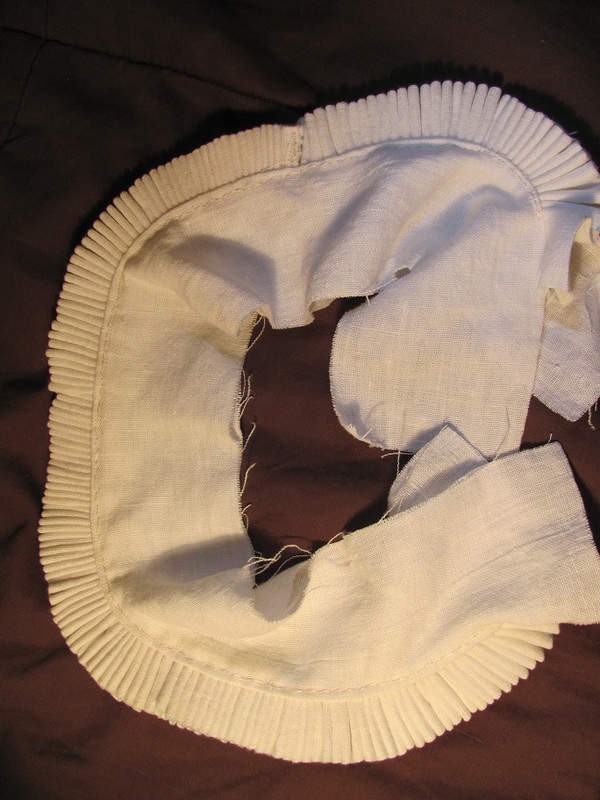 Unlike partlets from other areas at this time, it was a very simple design with no shoulder or back seams. It was wider at the bottom than it was at the shoulders.